Many patients want to have the benefits of a beautiful straight smile, but do not want to be inconvenienced with wearing unsightly metal braces for several years. 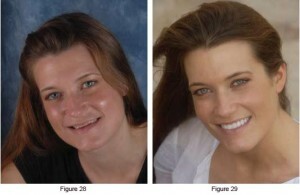 This is where the Invisalign method can make a difference. Invisalign is an alternative to traditional braces, where the patient uses a series of clear aligners that are custom molded to fit the patient’s teeth. The aligners are gradually repositioned over time to adjust the smile and give the desired result. Currently, Smile South Florida is offering a 25% off regular price special on Invisalign treatment that will run until September 1st, 2009. This offers a huge savings to the patient, especially since Invisalign is typically not covered by many dental insurance plans. The cosmetic dentists at Smile South Florida Cosmetic Dentistry have offices in Broward County and West Palm Beach and provide Boca Raton Dentistry, Fort Lauderdale Dentistry and Miami Dentistry. The dentists specialize in dental aesthetics including porcelain veneers, dental implants, extreme makeovers Invisalign, and sedation dentistry. The case presented here was featured on the cover of the Spring 2008 issue of The Journal of Cosmetic Dentistry. While it was quite challenging, I will never forget this case,, as it changed the life of a recovering bulimia patient. Eating disorders affect approximately seven million people in the United States. Although I have seen the effects of bulimia on the dentition previously, never have I witnessed it to this extent. The patient was diagnosed with loss of vertical dimension as a direct result of bulimia and bruxism. The patient, a 30-year-old female, wanted to improve her smile and to address the constant fracturing of her teeth. Although it was difficult for her to discuss, she told me about her history of bulimia and that after a long struggle, she is now recovered. She was ready not only to change her smile, but also to see what could be done about her “collapsing” face, as she put it. She confessed that her unwillingness to smile was affecting her socially and that she always covered her mouth when she laughed (Fig 1). After performing a thorough clinical examination, I noted a severely worn dentition, widespread abfraction lesions, and multiple fractured teeth and restorations. The palatal surfaces of the maxillary anterior teeth were completely eroded and devoid of enamel, as is typically seen with bulimic patients (Figs 2 & 3). As expected, the patient’s teeth were very sensitive to temperature changes. Tooth #5 had been extracted due to a fractured root, and in its place was a successfully osseointegrated implant (Straumann USA; Andover, MA) that had been placed one year earlier. She had lost approximately 30% of the length of her central incisors due to attrition. Upon radiographic examination, no severe decay or pulpal pathology was evident. Periodontal probing depths were within normal limits. She tolerated the orthotic well and felt much better with it in place. Initially this case was overwhelming, as there were so many factors necessary to achieve a successful treatment outcome. After mounting and studying the casts, it was obvious that the patient’s vertical dimension had to be increased to a proper, comfortable position, which has been called the physiologic neuromuscular position.3 Once this position was determined, an orthotic appliance would be worn to verify that this proposed position was in fact well tolerated and that the TMD symptoms had decreased significantly. During the orthotic therapy phase, this appliance would be worn for a minimum of three months (for a minimum of 22 hours a day), to determine whether it would help before any permanent alteration of the patient’s teeth. 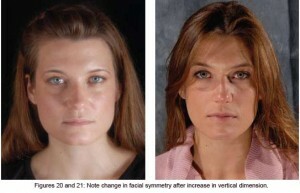 The first step in this case was to determine how much to increase the patient’s vertical dimension. Once this position was determined, it was imperative to test and verify it; and, most importantly, to maintain it throughout the different phases of treatment. The treatment phases were as follows: Orthotic, preparation, temporization, and cementation. To find a more optimal bite position, a series of diagnostic tests were performed. These included electrosonography to record and analyze joint sounds, electromyography to record and analyze muscle activity, and computerized mandibular scanning (CMS) to track and analyze jaw movements. It was determined that the patient’s habitual occlusion was in a muscular state of hyperactivity when at rest and in light centric occlusion (Fig 4). In order to relax her muscles, which were in a chronic spasmodic state, ultra-low frequency transcutaneous electrical neural stimulation (TENS) was applied using a myomonitor (Myotronics). The myomonitor stimulates cranial nerves V, VII, and XI to relieve hypertonicity, restore normal blood flow, and wash away toxic wastes such as lactic acid. This restores the muscles temporarily to a relaxed and normal resting length (Fig 5). These muscles become “deprogrammed,” and, by measuring their pre- and post-relaxation status, we are provided with precise and objective comparative data.10,11 The details of all the tests performed during the three-hour diagnostic appointment are beyond the scope of this article. Once it was determined that the bite was stable and that symptoms were significantly reduced, EMG recordings were taken again to verify that the muscles were not hypertonic in this new position. In this case the EMG readings were more than satisfactory, and the patient’s headaches and other symptoms were reduced significantly. Therefore, I had great confidence as to where to restore her occlusion.14 Her bite was opened 4 mm. The next phase of treatment was the restorative phase. (Laboratory Phase) Much effort was spent determining the proper physiologic position for this patient, and much care had to be taken in managing and maintaining this position throughout the course of treatment. Prior to the preparation appointment, new impressions were taken and sent to the laboratory, along with the actual adjusted orthotic to mount the case. In addition, three measurements were provided so that the laboratory could verify that the case was properly mounted. These measurements were taken with a digital Boley gauge. The areas measured were where the most apical areas of tooth surface intersect with the gingiva between teeth #8 and #25, #14 and #19, and #3 and #30 (Figs 6 & 7). In this situation, the dentist and the laboratory must measure in the exact same three locations throughout the course of treatment, so as to ensure accuracy and precision in maintaining the new vertical (Figs 8 & 9). Because the patient’s maxillary anterior teeth were short, it was determined that crown lengthening was necessary to support the restorations. Therefore, the proposed amount of hard and soft tissue removal was relayed to the laboratory so that they could compensate for the change in measurement in this area. With this information in hand, they waxed up the 28 teeth in the new position, taking into consideration the hard and soft tissue reduc-tion in the anterior; and once again verified the three measurements (Fig 10). From this wax-up, they prepared a temporization stent made f r o m Sil-Tech putty and relined with a light-body wash material (Aquasil XLV, Dentsply Caulk). This would be used to fabricate the 28 temporaries after tooth preparation, with the same vertical dimension and occlusion as the orthotic. (Preparation Phase) Prior to the preparation appointment, I ensured that I received everything necessary f r o m the laboratory. First, I verified that the waxed-up models were consistent with the three measurements I had provided to the laboratory, by measuring the teeth in the exact same three locations. Second, I verified that I was satisfied with the smile design and occlusion. As this was to be a lengthy appointment, the clinical team met and reviewed procedures. After the patient was seated, I verified the bite stent that had been made on her unprepared, mounted models by placing it in her mouth and having her close down on it. I again measured the same three locations and verified that those measurements were the same as they were with the orthotic in place (Fig 11). I was confident that all of my numbers were accurate, so it was time to begin preparing the teeth. It was imperative not to lose control of the bite at any time during the preparation. After anesthetizing the patient, the first step was to perform the soft and hard tissue crown lengthening in the maxillary anterior region to improve the length of her short clinical crowns. To accomplish this, I used an Er,Cr:YSGG hard/soft tissue laser (Waterlase, Biolase Technologies; Irvine, CA) and at the same time performed a frenectomy between the maxillary central incisors. Using this laser provided a predictable result and gave me a clean field within which to work. I removed 1.2 mm of tissue and therefore changed the location of my uppermost point for measurement after the crown lengthening. I had to adjust my number for verification f r o m this point on, in this area only16 (Fig 12). It was imperative not to lose control of the bite at any time during the preparation. To help in maintaining this vertical dimension, I used the bite stent provided by the laboratory to sequentially reline it while I prepared one quadrant at a time. Beginning with the upper right quadrant, I prepared ##3-8, while leaving #2 unprepared to provide extra stability while I relined the bite stent. To register the bite, I sat the patient upright and placed a small amount of fast-setting bite registration material (Regisil Rigid) in the bite stent, being careful not to overfill it and to reline only the prepared teeth. This was then placed in the mouth with the patient biting into it. While the stent was in her mouth, the same three locations were measured again, remembering that the anterior area had a new measurement. If the measurements had not matched those taken previously it would have been necessary to repeat the reline, as the patient might have been biting incorrectly or the bite stent might not have been seated over the teeth properly. Once it was determined that the measurements were correct, the stent was removed, trimmed, and set aside for the next quadrant. The same procedure was repeated for the upper left quadrant, preparing ##9-14 and leaving tooth #15 unprepared. This quadrant was then relined the same way. After the measurements were verified, I prepared #2 and #15 (Fig 13). This procedure was repeated for the bottom right quadrant and then the bottom left. A final check of the measurements was made and the bite stent was set aside to send to the laboratory along with final impressions. For these, I used a PVS heavy-body material and an extra-low viscosity wash material (Aquasil Ultra-heavy and XLV). A symmetry bite was also taken, indicating to the laboratory the proper occlusal plane and midline. Photographs of the preparations, which showed the measurements with the final bite stent seated and with the symmetry bite in place, were provided for the laboratory. The provisional restorations were fabricated using the temporary stents made f r o m the wax-up. The stents were filled with temporary material (Luxatemp shade B1, Zenith/DMG; Englewood, NJ) and placed over the maxillary prepared teeth. After three minutes the stent was removed, as was a small amount of flash. This procedure was repeated for the bottom teeth. Once the provisionals were in place, all three measurements were once again verified; at this time we evaluated esthetics and occlusion. To properly maintain the health of the gingival tissue during the four-week provisional phase, the patient was given a sonic toothbrush (Sonicare, Philips Healthcare; Andover, MA), as well as instructions on how to use rubber tips to massage her tissue. A follow-up visit was scheduled for the next day to confirm that the occlusion was comfortable and that we were both satisfied with the smile design. Proper communication with the laboratory is crucial for a successful outcome in each and every case sent to our ceramist. In this case, it was important to send as much information as possible with regard to maintenance of the patient’s vertical dimension, as well as esthetics. Photographs showing all three measurements in the final bite stent, as well as in the provisionals, were sent to the laboratory. In addition, retracted frontal and lateral views of the preparations were provided, as well as a picture showing the prepared shade (Vita A3, Vident; Brea, CA).17 When the laboratory received the case, the first step was to verify the measurements after mounting the prepared models. This was accomplished by using the relined bite stent and verifying the accuracy of the vertical dimension in the same three locations. For the smile design, we decided on a “soft” look with square oval central incisors and slightly rounded laterals and canines, with the lateral incisors 0.5 mm shorter than the centrals. The requested width of the central incisors was 8.25 mm and the length was 10.75 mm. The lateral incisors were approximately 10.25 mm long. Golden proportion rules and smile design principles were adhered to, which provided the patient with a very soft and esthetically pleasing smile. Our final shade choice was OM2 body with a cervical blend to OM3 (Vita 3D Master shade guide), with the canines blending f r o m OM2 to 1M1 cervically. We selected Authentic pressable ceramic (Jensen Indus-tries; North Haven, CT) for all anterior teeth and bicuspids, using an OP1+ ingot with cutback technique and adding intense opaque modifiers to increase vitality and a natural appearance (Fig 14).18All of the molars were restored with Noritake CZR pressable ceramic (Zahn Dental, Henry Schein; Melville, NY) over zirconia copings.19 The #5 implant was restored with a custom abutment with Creation porcelain (Jensen Industries). Prior to the fabrication of the restorations, the models were mounted using the preparation bite stent, and all the measurements were verified by the laboratory (Figs 15-18). After we received the case f r o m the laboratory, I checked the restorations on the models for proper margins and contacts, and to ensure that the smile design had been followed. Once all the restorations were mounted on the models, the three areas were measured to verify that the laboratory maintained the vertical dimension. Once the patient was anesthetized, the provisional restorations were removed. The prepared teeth were cleaned with pumice, followed by hydrogen peroxide and chlorhexidine (Consepsis, Ultradent; South Jordan, UT). Each restoration was tried on with water and inspected individually. Contacts and margins were examined, as was the overall smile design. Once we were satisfied with restorations, they were cleaned with 37% phosphoric acid, rinsed, dried, and set aside. The molars were cemented first using Multilink (Ivoclar Vivadent), a self-etching universal resin cement, with the inside of the restorations coated with the metal/zirconia primer (Ivoclar Vivadent). Then all of the remaining upper teeth except #5 were etched with 37% phosphoric acid and rinsed, after which a wetting agent was applied (Super Seal, Phoenix Dental; Fenton, MI).20 Then the bonding agent (Excite, Ivoclar Vivadent) was placed on the teeth according to manufacturer’s directions and light-cured. The restorations, which had previously been etched with hydrofluoric acid, were coated with Silane primer (Kerr; Orange, CA). The luting resin used for cementation was Variolink Veneer +2 (Ivoclar Vivadent). All of the restorations were placed simultaneously and spot-cured. The excess was then removed, followed by the final light-cure. Tooth #5 was cemented with implant cement (Premier Dental; Plymouth Meeting, PA).21 The same technique used on the maxillary teeth was applied to the lowers. Once all teeth were cemented, the three measurements were once again verified to confirm maintenance of the vertical dimension (Fig 19). The patient returned for follow-up appointments to make sure her bite was stable and that she remained symptom-free. This patient’s case involved many of the challenges we face daily in our practices. Just a few years ago, however, I would not have known in which direction to take her treatment. Perhaps I simply would have provided her with a bruxism appliance, while “patching up” some of her fractured restorations and attempting to improve her smile by restoring some of her anterior teeth with direct resins. These would have failed repeatedly, causing us both much frustration. I conducted a series of diagnostic tests using computerized instrumentation, which provided me with objective data that I was able to use in my treatment planning. The key point is that this patient initially exhibited severe occlusal disharmony and craniomandibular dysfunction. This can be the case in many of our patients, and much effort should be spent in proper diagnosis and treatment planning.22 I did not prepare 28 teeth in one visit and deliver them a few weeks later. Instead, I conducted a series of diagnostic tests using computerized instrumentation, which provided me with objective data that I was able to use in my treatment planning. Not until the patient’s new vertical dimension position was tested for several months did I dare touch a single tooth with a handpiece. Once I did, however, it was with great confidence, because I knew in which direction I was headed (Figs 20 & 21). It is well accepted that there is more than one philosophy or method that can be utilized to arrive at a physiologic bite position. A discussion of these different philosophies— whether centric relation, centric occlusion, or neuromuscular—is beyond the scope of this article.23 However, as responsible clinicians, we should study the different treatment modalities available to our profession before making a decision as to which one suits us. Whichever method you apply in your practice, the most important factor is that it must be in your patients’ best interests.24 Before proceeding to final restorations, it is imperative to establish a comfortable, stable bite derived f r o m verifiable, objective clinical data (Figs 22-29). The author thanks Duckee Lee, CDT (Protech Dental Studio, Sterling, VA), for his passion, talent, and technical excellence in creating the beautiful restorations in this case. A debt of gratitude also goes to the American Academy of Cosmetic Dentistry for 13 years of excellent continuing education, camaraderie, and a remarkable credentialing program, in which he learned during his Accreditation journey that, “your hand can only perform what your eyes have been trained to see and comprehend”; and to the Las Vegas Institute for Advanced Dental Studies for its dedication to postgraduate education. Finally, thanks, appreciation, and best wishes goto Erica, the patient in this case, for her patience, kind spirit, and courage. 1. Okeson JP. Management of Temporomandibular Disorders and Occlusion (3rd ed.). St. Louis, MO: Mosby; 1985. 2. Coy RE, Flocken JE, Adib F. Musculoskeletal etiology and therapy of craniomandibular pain and dysfunction. Cranio Clin Int 1(2):163-173, 1991. 3. Jankelson RR. Neuromuscular Dental Diagnosis and Treatment. Volume 1 (2nd ed.). Tokyo: Ishiyaku EuroAmerica; 2005. 4. Naeije M, Hansson TL. Short-term effect of the stabilization appliance on masticatory muscle activity in myogenous craniomandibular disorder patients. J Craniomand Disord Facial Oral Pain 5:245-250, 1991. 5. Ormianer Z, Gross M. A 2-year follow-up of mandibular posture following an increase in occlusal vertical dimension beyond the clinical rest position with fixed restorations. J Oral Rehab 11:877-883, 1998. 6. Liu ZJ, Yamagata K, Ito G. Electromyographic examination of jaw muscles in relation to symptoms and occlusion of patients with TMJ disorders. J Oral Rehab 26(1):33-47, 1999. 7. Neill DJ, Howell P. Computerized kinesiography in the study of mastication in dentate subjects. J Prosthet Dent 55(5):629-638, 1986. 8. Mongini F, Tepia-Valenta G, Conserva E. Habitual mastication in dysfunction: A computer-based analysis. J Prosthet Dent 1:484-494, 1989. 9. Jankelson B. Three dimensional orthodontic diagnosis and treatment: a neuromuscular approach. J Clin Orthod 18(9):627-636, 1984. 10. Ow RK, Carlsson GE, Jemt T. Craniomandibular disorders and masticatory mandibular movements. J Craniomand Disord Facial Oral Pain 2(2):96-100, 1988. 11. George J, Boone M. A clinical study of rest position using the kinesiograph and myomonitor. J Prosthet Dent 41(4):456-462, 1999. 12. Konchak P, Thomas N, Lanigan D, Devon R. Freeway space using mandibular kinesiography and EMG before and after TENS. Angle Orthod 58(4):343-350, 1988. 13. Balciunas BA, Stahling LM, Parente FJ. Quantitative electromyographic response to therapy for myo-oral facial pain: A pilot study. J Prosthet Dent 58:366-369, 1987. 14. Isberg A, Widmalm S, Ivarsson R. Clinical, radiographic, and electromyographic study of patients with internal derangement of the temporomandibular joint. Am J Ortho 88(6)453-460, 1985. 15. Griffin JD. How to build a great relationship with the laboratory technician: Simplified and effective laboratory communications. Contemp Esthet 10(7):26-34, 2006. 16. Colonna M. Crown and veneer preparations using the Er,Cr:YSGG Waterlase hard and soft tissue laser. Contemp Esthet Rest Pract 10:80-86, 2002. 17. Bengel W. Mastering Dental Photography Hanover Park, IL: Quintessence Pub.;2002. 18. Magne P, Belser U. Bonded Porcelain Restorations in the Anterior Dentition: A Biomimetic Approach. Hanover Park, IL: Quintessence Pub. ; 2002. 19. Ludwig K. Studies on the ultimate strength of all-ceramic crowns. Dent Laboratory 39:647-651, 1991. 20. Kanca J. Improving bond strength through acid etching of dentin and bonding to wet dentin surfaces. JADA 123:35-44, 1992. 21. Garg AK. Practical Implant Dentistry (1st ed.). Dallas, TX: Taylor Publishing; 2007. 22. Tingey EM, Buschang PH, Throckmorton GS. Mandibular rest position: A reliable position influenced by head support and body posture. Am J Orthod Dentofac Orthop 120(6):614-622, 2001. 23. Pully ML, Carr S. Solving the pain puzzle: Myofascial pain dysfunction (3rd ed.). Albuquerque, NM: TMData Resources; 1997. 24. Shankland WE . Temporomandibular disorders: Standard treatment options. Gen Dent 52(4):349-355, 2004. Top patients of Miami Cosmetic Dentist & Palm Beach Cosmetic Dentist, Dr. Charles Nottingham will be attending. They will be providing video testimonials, which will be placed on Smile South Florida’s website. Some videos may be featured on Plum Television. Patients will be served champagne, cake, and assorted crudités. When patients leave, they will be given goody bags. Professional make-up artist Ana Baidet will be doing camera ready touch-ups and airbrushing. The Emmy Award Winning TV station Plum Television will be filming the event. Cosmetic Dentist in Florida, Charles Nottingham, D.D.S., Fellow in the Academy of General Dentistry, is an internationally and nationally renowned cosmetic dentist. He has been creating dazzling, healthy smiles for his patients since 1974. Plum operates television channels and websites in Nantucket, Martha’s Vineyard, the Hamptons, Miami Beach, Sun Valley, Vail, Aspen and Telluride; destinations of choice for over 14 million of the nation’s most interesting and influential people each year. They are Plum’s audience as well as its content. Plum is available to a broader audience beyond its communities through video on demand and the Internet at plumtv.com. The Wöhrle Dental Implant Clinic delivers unprecedented patient care and convenience by offering all aspects of implant therapy in one cutting edge facility. While typical implant dentistry involves patients traveling back and forth between specialty and/or general practice offices, The Wöhrle Clinics are staffed by doctors encompassing skills in implant surgery, implant prosthodontics and implant laboratory technology. Additionally, the Wöhrle Dental Implant Clinic comprises a state-of-the-art office with CAT scanning and computer guided surgical technology onsite. Minimally invasive techniques, based on computer guided surgery, are routinely performed for better outcome and patient comfort. The volumetric images obtained by the iCAT are high-resolution, three-dimensional views of the patient’s anatomy. In the Clinic, low radiation and fast turnover are extremely important for a routine application prior to any implant placement. From initial scan to discussing treatment options with the patient typically takes less than 2 minutes. At that point, I present the findings to the patient and present different treatment options with confidence. Critical information such as available osseous height and width, proximity to vital structures and adjacent teeth and potential need for grafting procedures are easily visualized by experienced users. In addition, the data collected will be used later for the virtual surgery within the NobelGuide software. Using NobelGuide enables me to diagnose and treatment plan every patient in a most efficient and predictable way. Once diagnostic appliances have been fabricated, the CAT-scan is used to place the implants in a virtual environment. Based on this information, a surgical template is fabricated, which transfers the virtual planning exactly to the patient’s anatomy, and implants can be delivered precisely, when indicated in a flapless approach. Simultaneously, interims restorations can be prefabricated and placed at the time of implant installation. Once soft- and hard tissue remodeling has occurred, final impressions are taken. Restorations are completed using the Procera system, in either zirconia, alumina, or titanium, depending upon the patient’s needs and desires. Studies have shown that the marginal fit and strength of these restorations is superior to anything else on the market; in addition, the aesthetic outcome satisfies even the most critical patient. I have been a Mac aficionado since the introduction of the first Apple Macintosh. In a dental practice, it was hard to incorporate the Mac as most of the software was designed to run on PCs. We had a split system, PC for office administrative aspects, Macs for patient education, slide collection and organization, and for the preparation of lectures. Of course, any videos we took were handled on the Mac side as well. Then we switched our office administration software to MacPrcatice DDS, which was developed specifically for Mac OS X. Since then, we have eliminated most of our PCs, and most of the problems have gone away along with the PCs. All operatories, surgical suites, the treatment plan room, the front and back offices, all have their own Apple computers, and all share the same network. The support we receive from MacPrcatice is outstanding, and new developments keep on coming, like the iPhone interface, allowing me to check either the schedule, patient records or anything else that is documented in the system from any place in the world. The biggest advantage of using this system is the user friendliness that Macs are known for. With minimal training, motivated staff members can learn the intricacies of the system within a very short time. Magnification in dentistry is an absolute must – the first step in quality control. Since the beginning of my training in dentistry I am used to work with magnification, either at the bench or in the operatory. The right combination of comfortable glasses with adequate magnification and depth of field is hard to find among the many manufacturers. In addition, a headlight is needed in most cases where direct overhead light is either blocked or not in the same long axis. Using the most advanced combination of loupes and headlight, the Heine 3S unplugged, has made it easier for me to routinely see better, and thus being able to deliver better quality of care to my patients, all without any cable hanging off my back.